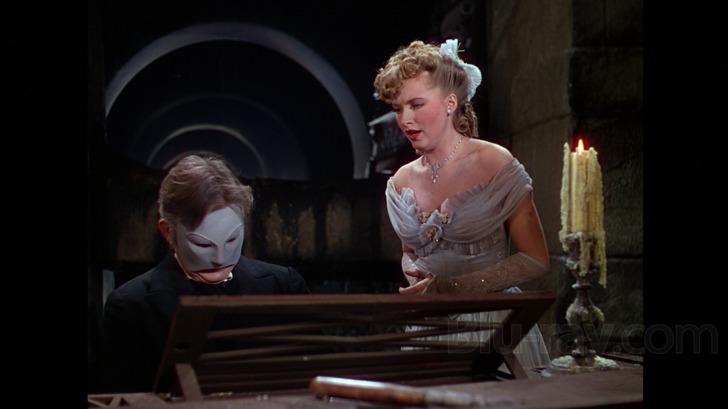 Universal’s 1943 remake of the 1925 Lon Chaney Sr. classic THE PHANTOM OF THE OPERA is definitely an ‘A’ movie in every way. 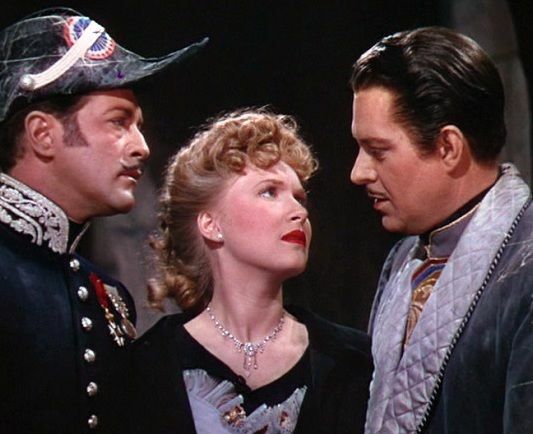 A lavish Technicolor production with an ‘A’ list cast (Claude Rains, Nelson Eddy, Susanna Foster) and opulent sets (including the Opera House interiors built for the ’25 silent), it’s the only Universal Horror to win an Oscar – actually two, for Art Direction and Cinematography. Yet I didn’t really like it the first time I saw it. It’s only through repeated viewings I’ve softened my stance and learned to appreciate the film. Claude Rains’s performance in particular has made me a convert. As Erique Claudin, he’s a sympathetic figure, and one can’t help but feel sorry for him. When he’s let go from the orchestra by the maestro, after twenty long years as a violinist, his arthritis causing his playing to become subpar, I felt pity for a man who gave so much for his art. Though he commits the murder of the publisher he believes has stolen his concerto, Erique didn’t deserve to have acid flung in his face by an angry secretary. His howls are that of a wounded animal as he escapes into the sewers below the streets of Paris. 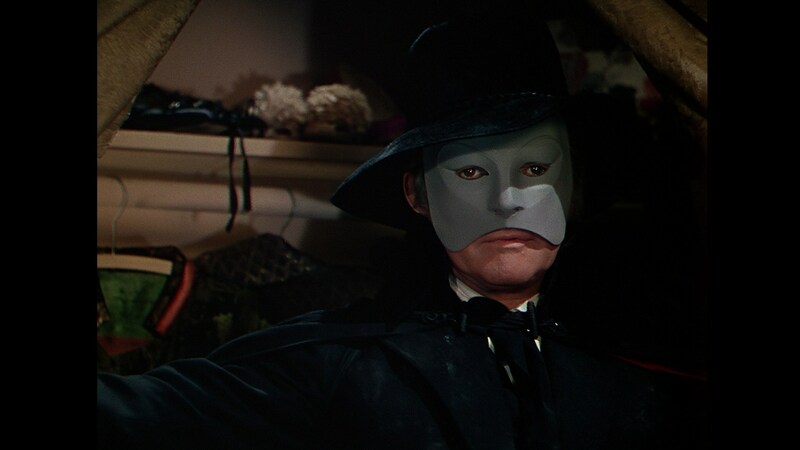 Rains, with his black cloak and hat, his grotesque face covered by a stage mask, cuts a fine figure as The Phantom. His only motivation is to further the career of budding soprano Christine, whom he’s loved from afar, and he’s determined to eliminate everything that stands in the way of that goal. His mind has become as scarred as his face, and like the best of monsters, he’s a figure to be pitied, not hated. Nelson Eddy (Anatole) and Susanna Foster (Christine) are in fine voice; even though opera’s not really my thing, I can certainly appreciate their talents. I could do without the love triangle with Christine, Anatole, and Inspector Raoul Dubert (Edgar Barrier), but it’s necessary to the plot as constructed by writers Eric Taylor and Samuel Hoffenstein, who took several liberties with Gaston Leroux’s 1910 novel in order to fit in Universal’s newest star Eddy, who’d recently left MGM after seven years under contract. A better-than-average supporting cast features J. Edward Bromberg , Leo Carrillo , a young Hume Cronyn , Jane Farrar, Fritz Feld, Steven Geray, Miles Mander, Frank Puglia, and Special Guest Star Franz Liszt! Actually, it’s not the famous composer (who’d been dead since 1886), but actor Fritz Leiber (father of science fiction writer Fritz Leiber Jr. ), who plays an important part in the proceedings. The score by Edward Ward consists of original operatic music especially composed for the film (though better ears than mine will notice some Tchaikovsky and Bach thrown in), and was also Oscar nominated (but lost to THIS IS THE ARMY, a patriotic flag-waver based on the music of Irving Berlin). Director Arthur Lubin took time off from helming Abbott & Costello vehicles to make PHANTOM OF THE OPERA, and does a fine job. 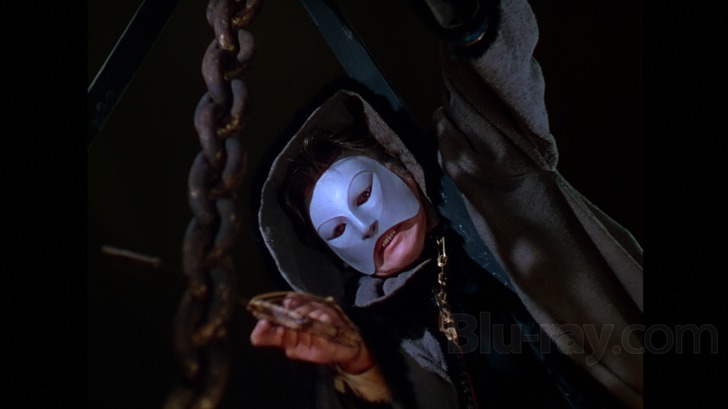 The famous chandelier scene is thrillingly staged, and the unmasking of The Phantom deep inside the catacombs (a highlight of the ’25 version) is sufficiently gruesome, although Jack Pierce’s makeup can’t hold a candle to Chaney’s iconic original. I admire the film today, with reservations. 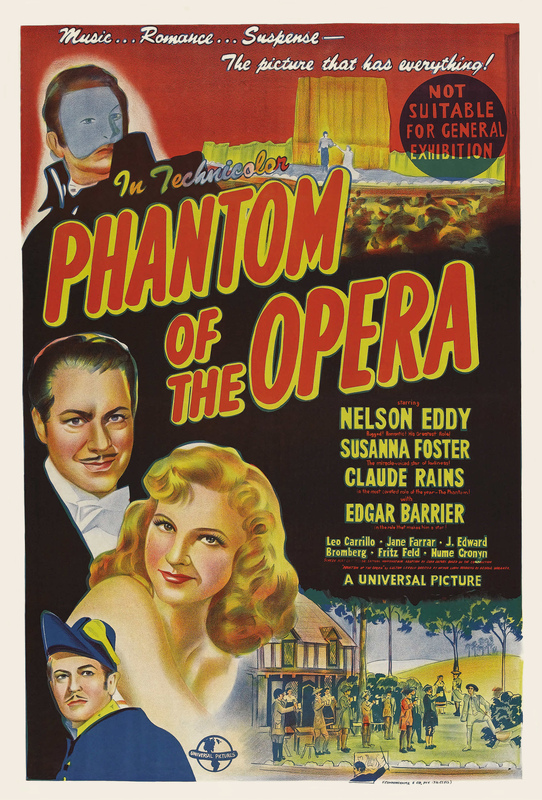 It’s more a Nelson Eddy/Susanna Foster vehicle than Universal Horror, and I would’ve liked to have seen more emphasis on Claude Rains’s Phantom. As it stands, it’s an uneven but interesting and watchable entry in the history of the horror film. Without the performance of the magnificent Claude Rains, I really doubt that this one would be well known today at all. 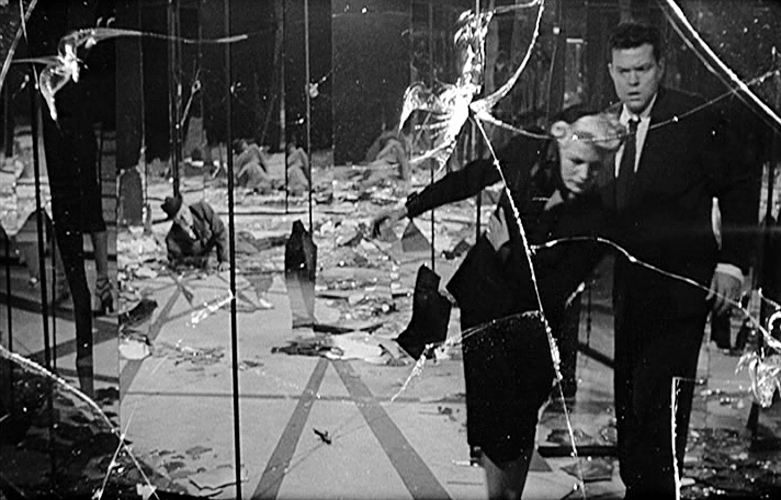 It has its moments, but it lacks real moments of horror and suspense, the one exception to that being the spectacular chandelier sequence. If this had had more scary moments(and stayed more true to the source material) it could have gone down as one of the greatest of Monster Movies. It is a good character piece though, and Claude Rains keeps you watching as it goes on. I like how Claude makes us sympathise with this Phantom, due to him being made deranged and evil by what happens to him at the beginning. I totally agree. Claude makes the movie – and next month, I’ll be taking a look at another Rains film, 1947’s “The Unsuspected”! LOVED this! Another 5 star recommendation!